Whether you already brought up the topic or are planning to, here’s some advice — from where to start, to how to compromise — on how to go minimalist and maybe even get your significant other on board too. The best, and only, place to start is with yourself. Work on areas of your home that are exclusively yours and items that only you own. Best bet? Your clothes. Going minimal with your wardrobe will give you a big clear window into what’s possible with minimalism. Going from a cramped closet, an over-stuffed dresser and a pile of shoes to an open, perfectly curated wardrobe space will let you see just what minimalism can do. Every time you get dressed in the morning, you’ll feel the ease and lightness that it brings. Starting here does 2 things. It lets you get going on your own, with or without discussing it with your partner. And it will help you put into words why you’ve decided to try this minimalist lifestyle. Tackle your part of the bathroom next. Paring down your supply of grooming/beauty products and supplies will simplify your morning routine. And make you love minimalism even more. By this time, unless your spouse is away on business, visiting an aunt in Bolivia or very very sleepy, they will have noticed that you’ve made some changes. Now’s the time to start talking honestly about how this process is making you feel. 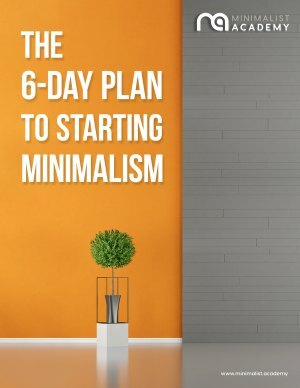 Since you’ve already started on the journey, you’ll have concrete evidence to support minimalism. How it saves you time, how not adding to your collection of possessions saves you money. How it makes you feel more relaxed and less mentally heavy. Chances are, your partner will have noticed the positives. She will have noticed your enthusiasm. He’ll see how it makes you more content with your home. So it’s probably a good time to ask: would your spouse like to join in? Remember, it took you a long time (like, your entire life) to get to your eureka moment when you realized you wanted to be a minimalist. So don’t expect your partner to wake up one morning as a non-minimalist and go to bed that night a converted person. Keep talking up the benefits you get from minimizing. Then widen your talk to include the benefits you see in the future — for the both of you. Less money spent of stuff means more money for paying of debt, or even better, a weekend getaway. Time saved not cleaning up the same piles of mess and clutter is more time the 2 of you can spend together, doing stuff you like to do. If all goes well, she’ll want to try this crazy idea out too. Best case scenario, He’ll see the benefits and go for it. Then it’s just a matter of talking it through, keeping it up and living life. Some spouses are going to be less enthusiastic. It might take a little more to get them to come around. And, in some cases, they may never come around. Be prepared for that scenario (we’ll talk a little more about it below). But before you get to that point, here are a couple ideas to try to help a hesitant partner ease into the idea of minimalism. We have powerful attachments to stuff. Or, possibly, stuff has a powerful attachment to us. Either way, it’s hard for some people to let go of their belongings. The reasons for this are so many. Everything from compensating for prior losses to filling emotional needs. Whatever the reason, some people will benefit from a gradual release of their possessions. One piece of advice we often give to people who are thinking of trying minimalism, but are a little wary, is the box method. Take anything in closets that you haven’t used recently. Find things you own that you’re keeping around but aren’t sure why. Pull out anything that you bought, used once and then set aside. Take as much as you can and put it in boxes. Label the boxes with the contents, tape it up and put it in the garage. In a closet. In a storage shed. Better yet, rent a storage unit and deposit the boxes. You don’t need that stuff. After a few weeks, maybe a month or 3, you will most likely find that your partner hasn’t needed to break the tape on a single box. Hasn’t needed to retrieve a single item. In the meantime, you’ve both been enjoying the ease and clarity of having a cleaner, less cluttered home. When enough time has passed, when you both can’t even remember what’s in those boxes, there will most likely come a time when your partner is ready to part with them. That may take 6 months, that may take a year. What you do next is important. Do not pass Go, do not collect $200. Do not open the boxes. Take them directly to your local charity and say goodbye. What usually happens next is people want to keep going. They feel the momentum of reducing, paring, minimizing. They like how it feels and get ready to do more. It’s a journey both of you can keep taking together. Or… You may have a partner who is just not ready. Just not willing yet. Here’s a few ideas how to approach them. When you find you’re running into opposition to your dream of a minimalist lifestyle, it’s time to take it outside. Couples who can talk through disagreements come out the other end stronger. Your home is distracting. Especially since the difference of opinion centers around your living space and all the things in it. Get your partner out of the house and on a walk. Walks are a great way to get the conversation flowing. You’re both out of your element, the trappings of your life are left at the door and you can just be a couple. When you talk about why you want to be minimalist with your partner, focus on the benefits of minimalism, not the drawbacks of a “normal” non-minimal style. When you focus on the good possibilities instead of the negatives of your current situation, you avoid anyone feeling attacked. After you’ve made your point, invite questions. Someone unfamiliar with minimalism may just not “get” it. Don’t take their questions as criticisms. Try to answer each one honestly and as informatively as you can. Then ask your own questions. If your partner is very resistant to minimalism, there is probably a reason. Or a few reasons. Listen to the “why”. Listen to her reservations. Listen to his concerns. Fully and openly listen. Get in their shoes and try to understand their reasoning. It could turn out they’re dealing with the same things you dealt with when you first began your minimalism journey. Or the hesitation could be issues that you both need to work through. Or it could be something your partner needs to work with on their own. In the end, not everyone is going to be a minimalist. That’s ok. Change is not something you can force on anyone, least of all your partner. Trying will just make things unhappy in your home. Accept your spouse for who they are, extra stuff and all. It’s ok for a couple to be 2 different people. Compromise is what makes relationships work. And just because your partner isn’t into it doesn’t mean you have to give up your dream of being minimalist. Talk to him about places in the home that can be “your” areas. Areas that you’re able to make look and feel the way you want. Assure her that there will still be “her” areas. Rooms or places where he can have his possessions exactly how he wants. Your office, her study, his garage. And so on. Introducing minimalism into a relationship can go one of 600 different ways. Many of them good! Just keep in mind that a relationship that evolves actually lasts longer. Change, new experiences, trying new things will almost always serve to strengthen your relationship. Especially when it’s changes and experiences that result in one or both of you feeling freer, happier and lighter. Remember, keep your approach to minimalism light, happy. In the end, minimalism is about bettering yourself and your home, step by step. Day by day. Increment by increment. It’s not about strictly forcing an unpleasant or uncomfortable change on yourself or anyone else. Have fun with it. Enjoy your path to a simpler lifestyle. Often all that a significant other needs to try a little minimalism for themselves, is to see someone they value and respect (you) having a good time and liking who they are with less stuff. When you live the life, walk the talk, and get excited about something, it’s only natural that others will too.